James Alexander Forbes was born August 9, 1896 in Thamesford. He attended Dickson’s School and was listed as a farmer at the time of his enlistment May 16, 1918, at the age of 21. 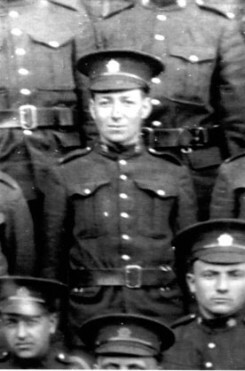 James enlisted in St. Thomas, and he served in the Army - Western Ontario Regiment, and 168th Battalion. Jim’s serial number was 3133149. He was stationed in England and France. After the war, Jim travelled to the United States and worked in Florida for a while, welding steel structures. A hurricane caused a halt in a lot of construction so Jim went to Detroit where he worked on the construction of the Hudson’s Bay building as a welder high up on the metal structure. He returned to the Thamesford area where he farmed near Glanworth with his brother, Gordon. In 1935 he married Annie (Kerr) Forbes and they bought a farm just southwest of Thamesford (Lot 21 Concession 1) that they would farm for decades. They also raised two daughters and were important parts of Thamesford and area.